Bangkok based Thai architect, author and designer Singh Intrachooto produces functional furniture art pieces that integrate local crafts and skilled carpentry with pure passion under the brand Osisu. Each piece is hand crafted from materials left to waste at construction sites or discarded from manufacturing processes. PAPI-Stool has paper torso, which has been carefully stitched by hands into organic patterns-to celebrate and not to camouflage the salvaged material. It is slightly undersize with the seating dimensions of an A4 sheet. Supported entirely by layers of embroidered papers salvaged from offices.It comes fron Etcetera collection. Etcetera is a collection where recycled and salvaged materials have been transformed by the hands of tailors, carpenters and artisans to achieve a modern appearance. Solid and straightforward woodwork, hand-pieced from teak morsels. Two cubes are simply merged for wider seating. Its top surface displays an array of wood grains, making Tilee-Diamonds subtly animated and fresh. Taking advantage of the weight of materials, the one square meter size of PMC-Living consists of only two legs. The legs made from recycled cartons become the counterweight to the cantilever top-surface handcrafted from laminated wood scraps. 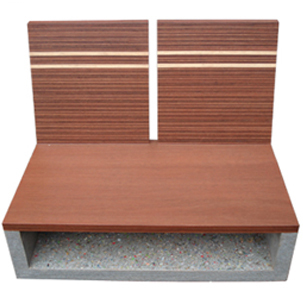 The design of loveseat combines reclaimed laminated woods with recycled carton boards. Each layer was laid carefully to achieve the crisp profile and gives an air of Asian hospitality. In PMC collection the materials used are thermal-pressed cartons (juice/milk/sauce packaging materials). With meticulous layering of colorful cartons, PMC collection has a rich patina that resembles concrete work. 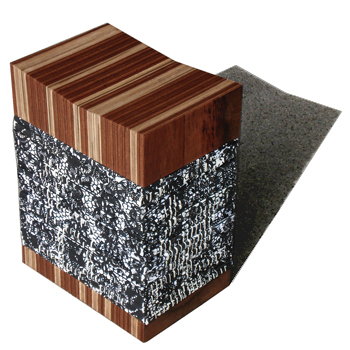 A seating surface made entirely from salvaged packaging materials and laminate wood scraps. The design exposes edges of the materials-displaying minimal standard surfaces. Made entirely from perforated chipboards reclaimed from old televisions, Medicine Cabinet is has glass shelves inside are which are also cut from construction waste. The motto here is reclaim and create!